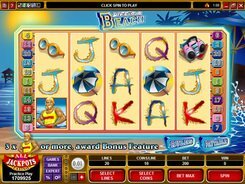 The appetizing Spring Break slot will make you feel hungry during the game since the reel symbols are all about delicious food items with a beach party twist. On the reels you will come across bottles of beer, ice cream, grilled meat, women taking sunbath, etc. 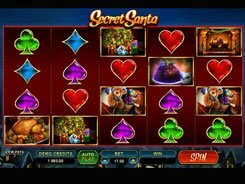 The slot features five reels, nine paylines, a bet ranging from $0.01 to $45 per spin, a wild, a scatter symbol and a round of free spins. The Spring Break logo is a wild the substitutes for other non-feature icons and doubles payouts when substituting. 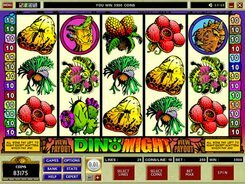 Besides, a wild pays out $50,000 if these five land across a payline. The second-largest award of $22,500 is paid out for getting five scatters anywhere in view, which in this case is the Beach Party icon. 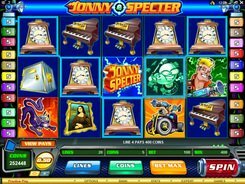 At least three scatters activate 15 free games at a x3 multiplier no matter where the scatters have appeared on the reels. 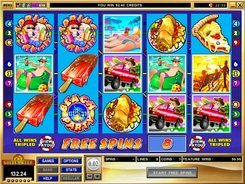 The round of free spins can be retriggered from within the free spins. 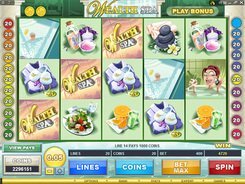 After a winning spin you may try to double or quadruple your win by clicking the Gamble button.